I had left the Bay feeling some type of way — the sad kind, nearly heartbreaking. 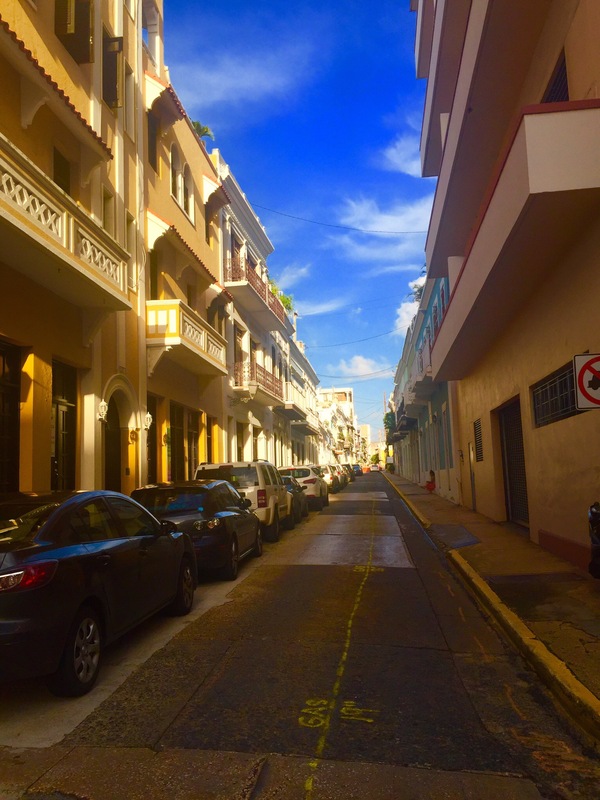 I felt like I needed to be in a new space, and the streets of Old San Juan buoyed my sadness with the vivacity of hues lining the streets. I marveled at the cobble-stoned roads, and the way that the houses bended and met at the slightest distance. My friend tried to cheer me up and although I was slowly distancing myself from the pains and the problems I was hoping to leave in the West Coast, I was slowly warming up to the city and its charm. Everywhere I looked was a potential story, a poem in the making. I smiled at the way sunlight caressed the side of a pink building, creating a distance between the darkness of my problems, a few steps from here and there. It is in dialogue with pain that many beautiful things acquire their value. Acquaintance with grief turns out to be one of the more unusual prerequisites of architectural appreciation. We might, quite aside from all other requirements, need to be a little sad before buildings can properly teach us. Perhaps it is the allure of a new environment, or the ways that windows curved that made for a slightly lighter heart. de Botton points out the way that architecture can shape our feelings, specially when there is a deep contrast between what we see and what we feel. …when we speak of being ‘moved’ by a building, we allude to a bitter-sweet feeling of contrast between the noble qualities written into a structure and the sadder wide reality within which we know them to exist. A lump rises in our throat at the sight of beauty from an implicit knowledge that the happiness it hints at is the exception. My friend and I kept walking and talking about our respective lives, having been friends for over ten years. We recounted the first time we met; to this day I will never forget how she made sinigang, a Filipino dish for me, a moment that I would always go back to as one of the warmest in the years I’ve been living in the U.S.
Old San Juan had remnants of its colonial past, statues depicting its Spanish colonizers much like the Philippines did. Before the trip I was catching tidbits of news about the poor state of its economy, and how its debt is a balloon waiting to burst. What I found instead was a kind of calm that was missing. We passed by a church, a children’s museum, apartment buildings and villas that swayed my mood. It wasn’t until I read de Botton’s book that I understood the ways that our surroundings, particularly architecture, evoke all kinds of emotions. Architecture is like one of those unspoken truths, an element of daily life that I’ve failed to give any thought simply because it’s there. What’s even more interesting when it comes to the structure, material and color of physical formations is that there is a recurring search for what is human — something that the viewer can relate to or identify with. A building can be towering and aggressive, a color can be feminine or gender non-confirming, a dining room can be humble and a patio, nostalgic. Architecture can arrest transient and timid inclinations, amplify and solidify them and thereby grant us more permanent access to a range of emotional textures which we might otherwise have experienced only accidentally and occasionally. As the day wore on, we decided to sit atop a hill overlooking the Atlantic Ocean. We watched the sun go down, just as rain started to fall. We ran to the nearest building for shade and held on to its Ionic-looking columns, laughing. We’ve come all this way, to the other side of the country, just to know that we still both can’t dance in the rain. Another quick laugh and we decided to venture out, towards the nearest plaza with a fountain in the middle. We played for a little bit, ate some of the best ceviche we’ve ever had and retired back to the hotel. 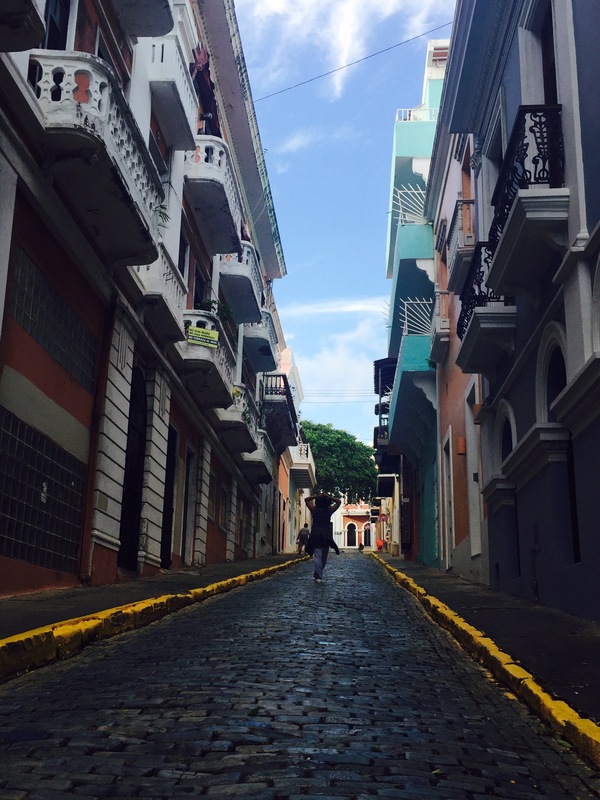 The yellow buildings and homes we passed by in Old San Juan reminded me of our house back in the Bay. It has only been really two days since I’ve been gone, and already I missed our little yellow space on Camelot Court. I managed to find a flight the next morning, because I needed to fix a few things back at home. To speak of home in relation to a building is simply to recognize its harmony with our own prized internal song. Home can be an airport or a library, a garden or a motorway diner. Our love of home is in turn a an acknowledgment of the degree to which our identity is not self-determined. We need a home in the psychological sense as much as we need one in the physical: to compensate for a vulnerability. We need a refuge to shore up our states of mind, because so much of the world is opposed to our allegiances. We need our rooms to align us to desirable versions of ourselves and to keep alive the important, evanescence sides of us. I absolutely love this post. 🙂 You wrote so beautifully, weaving the understanding from the book with your own experiences.